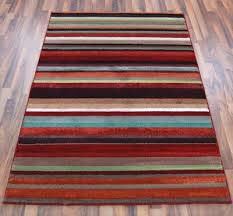 We are offering Multi Striped Chenille Rugs to meet the diverse requirements of our valuable clients. These Multi Striped Chenille Rugs are available in a plethora of colors, patterns and sizes. The finest grade fabric is utilized in the manufacturing process of these Multi Striped Chenille Rugs that ensures their durability and reliability. Our rugs are widely used in residences, hotels, motels, etc. Owing to their features like outstanding finish, durability, attractive look and beautiful designs, our Multi Striped Chenille Rugs are high in demand.